QUEENS, NY – Tom Goodwin was already thinking ahead. 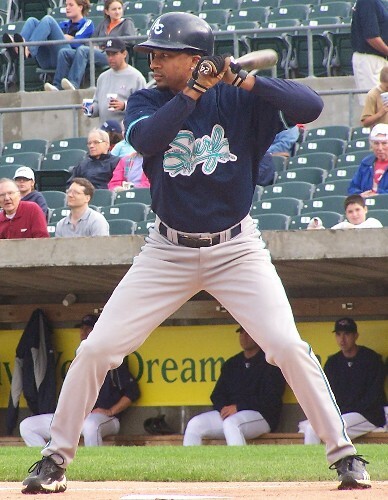 In 2005, he was playing in his 17th and ultimately final season as a pro with the Atlantic League’s now-defunct Atlantic City Surf, finishing out a very distinguished career on the independent circuit. Just three years removed from playing in the World Series with San Francisco, the speedy outfielder was hoping to get one last chance in the majors by playing with the Surf; he spent 14 straight years in the big leagues with the Dodgers, Royals, Rangers, Rockies, Giants and Cubs. As a player, the opportunity never materialized. However, Goodwin moved onto the next phase of his career, joining the Boston Red Sox organization as a coach and manager. The Mets named him their first base coach prior to the start of the 2012 season, and he’s been back in the big leagues ever since. But, little did he know at the time, he’d already started to make that transition during his time as a player in the Atlantic League. “(Surf manager) Jeff Ball used to give me some responsibilities as far as coaching third a couple times. I didn’t do well, but at least I got a chance to do it,” said Goodwin through a laugh prior to Game 5 of the World Series at Citi Field. It is not a surprise to anyone who’s been to a game in the affiliated minors or on the indy circuit that some players assigned to coach a base don’t always take the responsibility too seriously. “I was trying to, but it was my first time actually doing it, so it was different than what I thought it was actually going to be with the decisions you have to make over there at third base, how quickly you have to make them and the price that you pay if you make the wrong decision,” said Goodwin, who was 36 years old when he started his season with the Surf. Goodwin was a valuable part of many a major-league team as a player; his clubs reached the postseason four times, including San Francisco’s run to the World Series in 2002, a series they ultimately lost to the then-Anaheim Angels. It took Goodwin 13 years to get back, this time as a coach, and unfortunately the result was the same. But even as his club was on the verge of being eliminated, he was able to take enjoyment on what was a special season regardless of the outcome. “It’s been fun, it’s been a heck of ride,” he said. If Goodwin were to return for the 2016 season, his responsibilities with the Mets would likely remain unchanged. But, what he does on a day-to-day basis goes far beyond just serving as the first-base coach. “It’s making sure the outfielders are in place,” he explained. “We go through a lot of reports that we get from our advanced scouting; how pitchers are going to pitch these guys and trying to put the outfielders in the best position that we can. With being the first base coach, I look at the pitcher and see if I can pick up anything that he does differently when he goes home from when he goes to first to see if I can give a guy a chance to steal a base.